Ruffin Gallery is an active part of the Studio Art program. Each year the gallery hosts four to six exhibits that serve as the University's most important showcase for contemporary art and are an integral part of the Studio Art experience. Students are involved with the production and installation of these exhibitions and gain valuable experience in the handling and hanging of important works of all types. 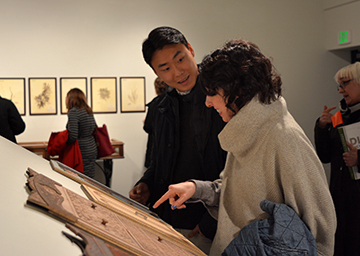 Every spring the gallery is the site of the Fourth-Year Thesis and Aunspaugh Fellows Exhibitions. The openings are important occasions when the whole studio program gathers to celebrate the successful completion of the major. "The New Barbarians: photo performance in defiance of 'documentation'" will be on view in the Ruffin Gallery from February 22 to March 29th, featuring photographs by RJ Muna in collaboration with this year's Distinguished Artists-in-Residence Guillermo Gómez-Peña and La Pocha Nostra. The exhibition will open with a photo-karaoke performance by La Pocha Nostra on February 22nd from 5-7 PM. “These ‘photo-karaoke performances’ seek to dissolve the borders existing between audience, performer and photographer. One unifying thread is a shared desire to portray a radical bohemian spirit still alive in San Francisco and demonstrate ways an experimental performance troupe can intersect with the Bay Area arts community.” -Emma Tramposch, Managing Director, La Pocha Nostra. + Earth. Fire. Air. Water.